Liam is 18, lives in London and plays bridge at Westminster School. He is part of the Bakhshi bridge family with parents David & Heather, and sister Jasmine, all also international players. Playing with Jasmine he won the 2016 Under 21 Pairs Championship. He also won the 2017 Year End Swiss Teams partnering his mum, with teammates David and Martin Seligman. He was part of the inaugural England Under 16 team, and a member of the first England U16 team to play in the European Championships, in 2015, where they finished in an excellent fourth place. He was then part of the U21 team which won a bronze medal at the 2017 European Youth Team Championships. Playing with Daniel Winter he made his debut in the Peggy Bayer competition in 2016, and he has played in three Channel Trophy competitions. 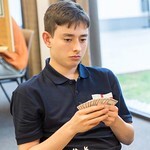 He was part of the winning team in the Sussex Cup competition at the 2016 Autumn Congress, and with Daniel he finished 17th= in the Swiss Pairs competition at the London Year End Congress.